Border Memorial: Frontera de los Muertos, Lukeville border crossing, Arizona, 2012. 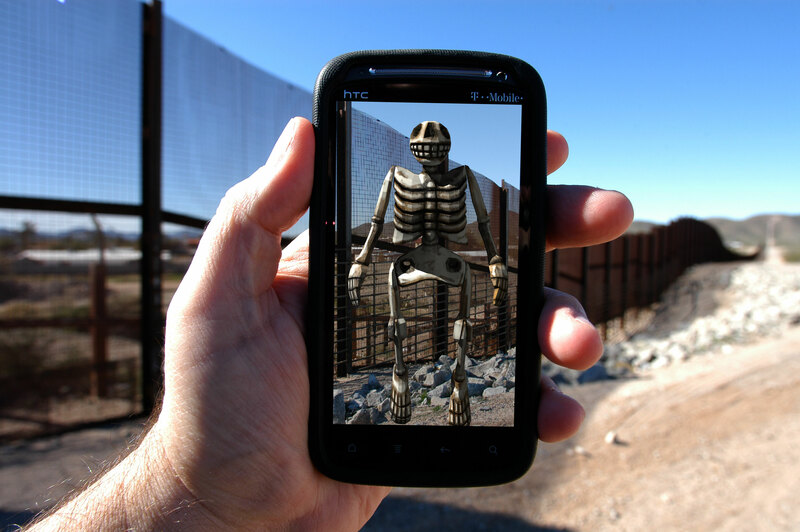 Border Memorial: Frontera de los Muertos is an augmented reality public art project and memorial, dedicated to the thousands of migrant workers who have died along the U.S./Mexico border in recent years trying to cross the desert southwest in search of work and a better life. This visualization in Google Earth indicates the GPS data points where remains have been recovered. Built for smart phone mobile devices, this project allows people to visualize the scope of the loss of life by marking each location where human remains have been recovered with a virtual object or augmentation. The public can simply download and launch a mobile application and aim their devices’ cameras at the landscape along the border and the surrounding desert. The application uses geolocation software to superimpose individual augments at the precise GPS coordinates of each recorded death, enabling the public to see the objects integrated into the physical location as if they existed in the real world. Based on a traditional form of wood-carving from Oaxaca, the virtual augmentation objects consist of life sized, three dimensional geometric models of a skeleton effigy or calaca which begins to rotate and float off into the sky when viewed with a mobile device. Calacas are used in commemoration of lost loved ones during the Mexican Día de los Muertos, or Day of the Dead festivals. Tracing their origins from Aztec imagery and ushered into the modern era at the turn of the twentieth century by Mexican artist José Guadalupe Posada, calacas are generally depicted as joyous rather than mournful. According to Aztec belief, despite the tragedy, death should always be celebrated. In the tradition of Día de los Muertos, the Border Memorial project is designed to honor, celebrate and remember those who have died and to vault this issue into public consciousness and American political debate. The project is intended to provide a kind of lasting conceptual presence in an otherwise ephemeral physical environment and cultural discourse. 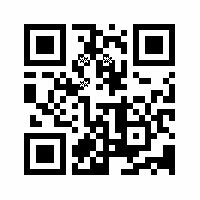 In the past twenty years we have witnessed the migration of the public sphere from the physical realm, the public square, to the virtual realm, the Internet. In effect, the location of public discourse and the site of national identity formation has been extended from the town square into the virtual world. Augmented reality allows us to overlay the virtual public sphere onto our experience of the physical world. Although thousands of people have died trying to cross the harsh desert landscape since security was ramped up in the border cities during the 1990’s, this issue has yet to even surface in the public consciousness. Everyone has an opinion about immigration, but few are even aware of, or simply choose not to acknowledge how many have died. 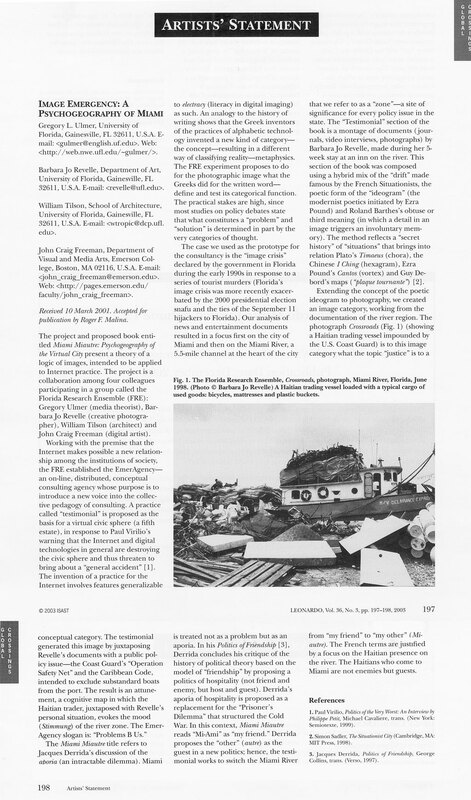 In his book Electronic Monuments, Gregory Ulmer writes about how successful monuments act as a public acknowledgement of loss on behalf of a shared value. If the United States chooses to value cheap strawberries, live-in childcare and every other value that migrant labor provides for our economy, it is time that we either acknowledge the cost of that value or change it. 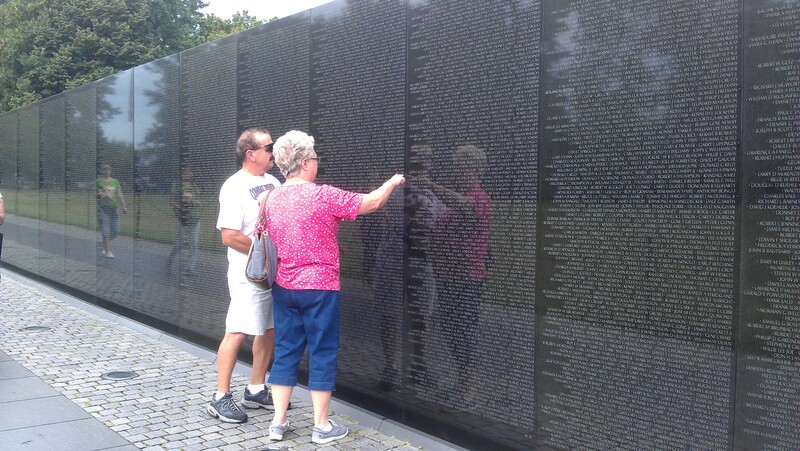 This project derives inspiration from public monuments and memorials such as Maya Lin’s Vietnam Veterans Memorial. In the Identity episode of the PBS program “Art 21,” Lin’s memorial work was described as “tactile experiences of sight, sound, and touch. They activate a full-bodied response on the part of the viewer, connecting us with the material aspects of their construction as well as with the private memories and thoughts that transform past events into awakenings in the present.” The Vietnam Veterans Memorial helped to shape national identity on an individual level with the intimate, one-on-one encounter embodied in the touch of a single name. People experience a similar intimate one-on-one encounter as the calaca appears on the screen of their mobile device. In a sense, they hold a memory of that individual in the palm of their hand. Additionally, the project draws on a rich tradition of large-scale public art in the form of the earth work and land art of the twentieth century. Perhaps this project might one day be regarded as the twenty-first century successor to Robert Smithson’s “Spiral Jetty,” James Turrell’s “Roden Crater,” Walter De Maria’s “Lightning Field,” Michael Heizer’s “Double Negative,” and other seminal public artworks of the American desert southwest. The “Border Memorial: Frontera de los Muertos” is a gesture of remembrance of those who have passed, and condolence and respect to those directly affected. However, the primary audience for this work is the whole of the North American people on both sides of the border. Although, it can be assumed that individuals will go out and experience the work first hand, the project should produce its true impact as it reverberates across the national media. Given the hyperbole and vitriolic punditry surrounding the politics of border security and immigration, it should not take long for this project intervene in the public discourse. Dr. Cher Krause Knight is an art historian who specializes in public art, including memorials and the earthworks of the Southwest. She is the author of Public Art: Theory, Practice and Populism (Blackwell, 2008), was founding co-chair of Public Art Dialogue (a professional organization), and is founding and current co-editor of the first peer-reviewed journal on public art, also titled Public Art Dialogue (published by Routledge/Taylor & Francis). Christina Marin is an Assistant Professor in the Department of Performing Arts at Emerson College, where she taught courses in Applied Theatre and Theatre of the Oppressed. Her primary research interests examine the intersection of theater as pedagogy and human rights education, as well as the use of Theatre of the Oppressed techniques as arts-based qualitative research methodologies. Salvador Olguin is a writer and researcher and the founder of Borderline Projects. He holds a MA in Humanities and Social Thought by New York University. He has studied representations of Death extensively, and has worked with Mexican cultural artifacts from the late nineteen and twentieth century. He was born in Monterrey, Mexico, and currently lives in Brooklyn. Highway 286, South Sasabe Road in Arizona with orange marker, March 7, 2016.